At La Samanna on St. Martin, guests are enveloped by a sense of calm that belies the busy byways and beaches of other parts of this heavily-touristed island in the French West Indies. Here, wrought iron gates guard white stucco structures entwined by tropical blooms while the 55-acre beach that fronts the resort, Baie Longue, is peppered with just a few fabulous-looking people. La Samanna is, bar none, the best place for an upscale celebration, discreet escape, honeymoon, or even destination wedding on St. Martin. So, it’s big news that this luxury resort, run by Orient-Express Hotels, is switching it up and moving ahead with extensive renovations. Out of La Samanna’s 83 rooms, 30 rooms have been completely redesigned while 20 have received an update with new furniture. The remaining rooms and public areas will be finished from September 1 – November 2, when the resort will close while work is ongoing. 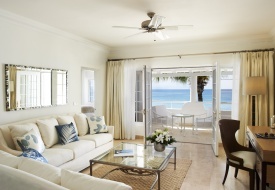 The décor in the newly-renovated rooms features a blue and white motif with white travertine floors, marble bathrooms with ceiling showers, shabby-chic style couches, and oceanview terraces. Some suites also have private plunge pools. The week before my visit, Allegra Versace had stayed in my room (unfortunately, the Italian heiress didn’t leave any designer gowns behind). Salma Hayek and Shania Twain are also fans. La Samanna feels more like the home of a dear friend than a luxury resort so it’s no wonder the rich and famous feel comfortable here. Discretion is paramount – despite my prodding, I was unable to convince anyone on the staff to surrender the name of a prominent politician who was staying in one of the resort’s four rental villas my last night on the island. In addition to the rooms and villas, the resort has a colonial bar, pool deck, beachside bar, European-style spa, and an extensive wine cellar which doubles as an exclusive venue for private parties and dinners (bring a shawl if you find yourself invited to dinner here, as the temperature in this below-ground cavern is kept cool for the wine). And for those interested in working off last night’s five-course French dinner with some water activity, sailing, kayaking, snorkeling, and scuba are also available daily – just ask one of the resort’s gorgeous dive experts for assistance and he will gladly oblige. There is a fitness center with stationary bikes, treadmills, and free weights as well as Pilates and yoga. You can even rent the resort’s 38-foot powerboat for a spin around the island, or go horseback riding on a nearby beach. What makes a trip to La Samanna even more enticing in the 2012 is St. Martin’s recent relaxation of its rules regarding marriage on the island. The island has decided to waive the requirements which exists in France that one of the couple must be a resident of the island in order to wed there. For more information on the new rules, click here. And for more information on La Samanna, visit www.lasamanna.com. For general trip-planning information, see our St. Martin guide.